In the world of online marketing, a great website design is everything! However, functionality and user-friendliness are just as important as visual appeal. 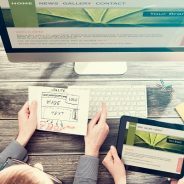 Below, we look at the top reasons why your company’s website might not be winning you as many new clients as you had hoped it would. Think about it – how much do people really care about the history of your brand or business? What they want to know is what you have to offer them… Can you solve their problems? Communicate this in your content and you’re sure to boost sales! Remember to also focus more on results rather than on features when it comes to your social media and content marketing efforts. You need to give them a reason to keep coming back – and what better way in which to do this than with the help of a blog? The key here is to keep updating it regularly. Not only will doing so provide your website visitors with valuable information, but it will help to improve your SEO and Google rankings in the long run, too. For professional assistance when it comes to website design guaranteed to drive sales, be sure to get in touch with the digital marketing experts at WSI OMS. We look forward to helping you boost your business.